Slavic mythology is the mythological aspect of the polytheistic religion that was practised by the Slavs before Christianisation. Old Slavic religion evolved for over a thousand years and some parts of it were from neolithic or possibly even mesolithic times. Unlike Bulgaria in 864 and was largely complete by the late 11th century.) Before that, sparse records of Slavic religion were mostly written by non-Slavic Christian missionaries. Archaeological remains of old Slavic cult images and shrines have been found, though little can be yielded from them without legitimate knowledge of their contexts, other than confirming existing historical records. Fragments of old mythological beliefs and pagan festivals survive up to this day in folk customs, songs, and stories of all the Slavic nations. There are currently no known written accounts of Slavic mythology predating the fragmentation of the Proto-Slavic people into West, East, and South Slavs, with the possible exception of a short note in Herodotus’ Histories, mentioning the tribes of Budini and Neuri in the far north, whose men, Herodotus claims, transform themselves into wolves for several days each year. Some researchers have interpreted this through the Slavic folk belief in werewolves, while others believe that Herodotus actually referred to ancient Slavic carnival festivals, when groups of young men roamed the villages in masks, sometimes referred to as vucari (wolf-humans). The identification of "Neuri" with Proto-Slavs remains controversial, however. The first authoritative reference to the Slavs and their mythology in written history was made by the 6th century Byzantine historian Procopius, whose Bellum Gothicum described the beliefs of a South Slavic tribe that crossed the Danube heading south in just two days. According to Procopius, these Slavs worshipped a single deity, who crafted lightning and thunder. Though not named explicitly, it can be deduced this is a reference to the deity known as Perun in later historic sources, as in many Slavic languages today (Polish 'piorun' for example). Perun simply means "thunder" or "lightning bolt". He also mentions the belief in various demons and nymphs (i.e. vilas), but does not mention any other names. The Slavic Primary Chronicle is a major work with many valuable references to the pagan beliefs of Eastern Slavs. The chronicle treats the history of the early Eastern Slavic state. Even though the manuscript was compiled at the beginning of the 12th century, it contains references to and copies of older documents, and describes events predating the Baptism of Kiev. Two deities, Perun and Veles/Volos, are mentioned in the text of the early 10th century peace treaties between pagan rulers of East Slavs and Byzantine Emperors. Later, Nestor the Chronicler describes a state pantheon introduced by Prince Vladimir in Kiev in 980 CE. Vladimir's pantheon included Perun, Hors, Dažbog, Stribog, Simargl, and Mokosh. The Hypatian Codex of the Primary Chronicle also mentions Svarog, compared to Greek Hephaestus. Also very interesting are the passages in the East Slavic epic The Tale of Igor's Campaign referring to Veles, Dažbog, and Hors. The original epic has been dated to the end of the 12th century, although there are marginal disputes over the authenticity of this work. The most numerous and richest written records are of West Slavic paganism, particularly of Wendish and Polabian tribes, who were forcibly made Christian only at the end of the 12th century. The German missionaries and priests who criticized pagan religion left extensive records of old mythological systems they sought to overcome. However, they hardly restrained themselves from "pious lies", claiming pagan Slavs were idolatrous, blood-thirsty barbarians. As none of those missionaries learned any Slavic language, their records are confused and exaggerated. Major works include a chronicle of Thietmar of Merseburg from the beginning of the 11th century, who described a temple in the city of Riedegost (Radegast) where the great deity Zuarasic (Svarožič) was worshipped. According to Thietmar, this was the most sacred place in the land of pagan Slavs, and Svarožič was their most important deity. Another very valuable document is the Chronica Slavorum written in the late 12th century by Helmold, a German priest. He mentions 'the devil' Zerneboh (Chernobog), goddess Živa, god Porenut, some unnamed gods whose statues had multiple heads and, finally, the great god Svantevit, worshiped on the island of Rügen who, according to Helmold, was the most important of all (Western) Slavic deities. 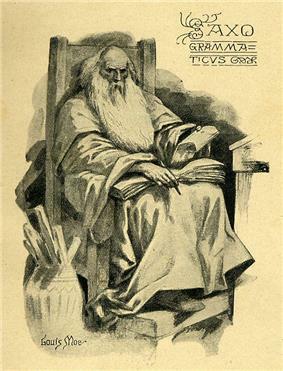 The third, and arguably the most important, record comes from the Danish chronicler Saxo Grammaticus, who in his Gesta Danorum described the war fought in 1168 by the Danish king Valdemar I against the Wends of Rügen, the conquest of their city at cape Arkona and the destruction of the grand temple of Svantevit that stood there. Saxo meticulously described the worship of Svantevit, the customs associated with it and the tall four-headed statue of the god. He also mentioned multi-headed deities of other Slavic tribes; Rugievit, Porewit and Porentius. The fourth major source is three biographies of the German warrior-bishop St Otto, who in the early 12th century led several military-pastoral expeditions into the regions of Slavic tribes living near the Baltic Sea. According to the manuscript, the most important Slavic deity was Triglav, whose temples in the city of Szczecin were respected oracles. In the cities of Wolgast and Havelberg, the war god Gerovit was worshiped, a likely corruption of Jarovit, a Slavic deity possibly identical to Jarilo of the East Slavic folklore. Though considered authentic by some Slavic neopagans, the Book of Veles appears to be a forgery from the first half of the twentieth century. Statues of several Slavic deities were discovered in 1848. On the banks of the Zbruch river, a tall stone statue was found, with four faces under a single stone hat. Because of its similarity to Saxo's description of the great image in the temple of Rügen, the statue was immediately proclaimed a representation of Svantevit, although it was clear it could not be the original Svantevit of Rügen. Several other multi-headed statues were discovered elsewhere. A tiny four-headed statue from the 10th century, carved out of bone, was unearthed among the ruins of Preslav, a capital of medieval Bulgarian tsars. 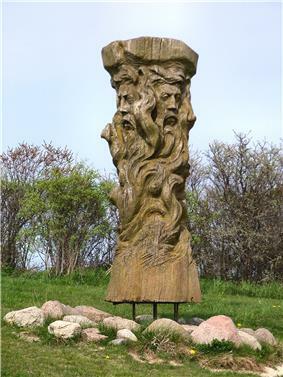 A two-headed, human-sized wooden statue was discovered on an island in the Tollensesee lake near Neubrandenburg: in the Middle Ages, this was the land of the Slavic Dolenain tribe, whose name survives in the name of the lake. Furthermore, a three-headed statue was discovered in Dalmatia (Croatia) on the hill bearing the name of Suvid, not far from the peak of Mt. Dinara called Troglav. The remains of several Slavic shrines have also been discovered. Some archeological excavations on the cape of Arkona on Rügen island have uncovered vestiges of a great temple and a city, identified with those described by Saxo. In Novgorod, at the ancient Peryn skete, archeologists discovered the remains of a pagan shrine likely dedicated to Perun. The shrine consisted of a wide circular platform centred around a statue. The platform was encircled by a trench with eight apses, which contain remains of sacrificial altars. Remains of a citadel with a more or less identical layout were discovered on a location with the suggestive name Pohansko (Paganic), near Břeclav in the Czech Republic. All these archeological remains have the multiplicity of aspects in common. 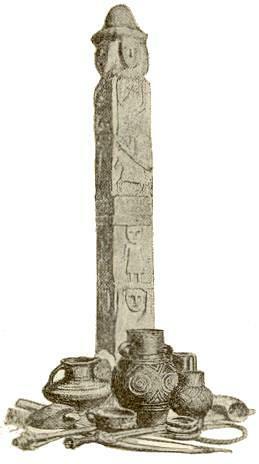 Statues of gods with multiple faces and remains of shrines with multiple sacrificial altars confirm written reports of Christian missionaries about the Slavs worshipping polycephalic gods, and also indicate that ancient Slavic mythology apparently put great emphasis on worship of deities with more aspects than one. Also quite important are remains of several pieces of pottery from 4th century Chernyakhov culture. Russian archeologist Boris Rybakov identified and interpreted symbols inscribed onto them as records of the ancient Slavic calendar. 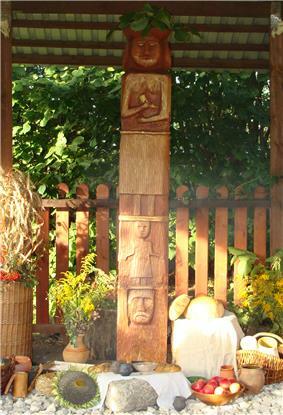 It is commonly claimed that worshiping among Slavic people often happened in the woods rather than in shrines. Such woods were called "gaje" in the Proto-Slavic language (compare Polish gaj 'small wood, thicket, bush, grove'; see: sacred grove), and were sometimes encircled by a fence, which created a sacred area, both a natural and social sphere. 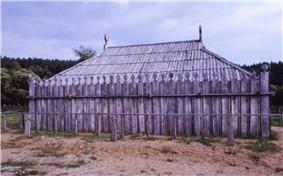 Sometimes they would be used as cemeteries as well (see Kleczanów Wood). The Indo-European custom of communal feasts was known as bratchina (from brat, "brother") in Kievan Rus', as slava ("glorification") in Serbia & Macedonia and as sabor ("assembly") in Croatia, Bosnia and Bulgaria. As various Slavic populations were Christianised between the 7th and 12th centuries, Christianity was introduced as a religion of the elite, flourishing mostly in cities and among the nobility. Among the rural majority of the medieval Slavic population, old myths remained strong. Christian priests and monks in Slavic countries, particularly in Russia, for centuries fought against the phenomenon called dvoeverie (double faith). On the one hand, peasants and farmers eagerly accepted baptism, masses and the new Christian holidays. On the other hand, they still persisted performing ancient rites and worshiping old pagan cults, even when the ancient deities and myths on which those were based were forgotten. This was because, from a perspective of the Slavic peasant, Christianity was not a replacement of old Slavic mythology, but rather an addition to it. Christianity may have offered a hope of salvation, and of blissful afterlife in the next world, but for survival in this world, for yearly harvest and protection of cattle, the old religious system with its fertility rites, its protective deities, and its household spirits was taken to be necessary. This was a problem the Christian church never really solved; at best, it could offer a Christian saint or martyr to replace the pagan deity of a pre-Indo-European matrilineal cult, but the cult itself thrived, as did the mythological view of the world through which natural phenomena were explained. While folk beliefs and traditions of all Slavic peoples indeed are the richest resource for reconstructing the ancient pagan beliefs, these may very likely have lost their original mythology and sanctity. People entertained a vague idea that some festivals must be celebrated in a certain way, some stories must be told or some songs must be sung, merely in accordance with tradition. Cults of old deities were mixed with worship of new Christian saints, and old rituals blended among new Christian holidays. 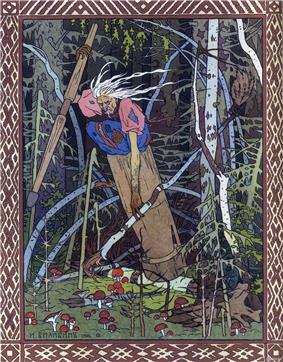 Fairy tales about various fantastical characters and creatures such as Alkonost, Baba Yaga, Koschei the Deathless, Firebird, Zmey, songs and tales of legendary heroes such as Russian bogatyrs, and superstitions about various demons and spirits such as domovoi, likho, vilas, vampires, vodyanoy, rusalkas, etc. Many of these tales and beliefs may be quite ancient, and probably contain at least some elements of old mythical structure, but they are not myths themselves. They lack a deeper, sacral meaning and religious significance, and furthermore they tend to vary greatly among various Slavic populations. 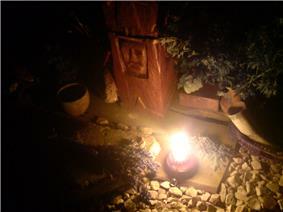 Folk celebrations of various St Blaise and St Nicholas, and it is also obvious that various folk celebrations, such as the spring feast of Jare or Jurjevo and the summer feast of Ivanje or Ivan Kupala, both very loosely associated with Christian holidays, are abundant with pre-Christian elements. These beliefs have considerable religious and sacral significance to the people still performing them. The problem is, of course, that the elements of pre-Christian religion are hopelessly mixed into popular Christianity. Reconstruction of original Slavic myths is thus true detective work, requiring a considerable knowledge of various scientific disciplines such as semiotics, linguistics, philology, comparative mythology and ethnology. Folklore accounts must be analysed on level of structure, not merely as songs or stories, but as groups of signs and symbols with some internal structural logic. Each of these signs is composed of some key words, which are more than simply names of characters, places or artifacts. One important aspect of symbols is that they are almost impossible to change; while their names may be altered, their structure may not. Changing or losing of key words would result in a change of symbol, which would then invalidate the internal structural logic of a text and render the entire tale meaningless. It would then soon be forgotten, because the pattern, or logic, through which it was transmitted over generations would be lost. For example: as already stated, the Slavic god of thunder, Perun, was mostly equated with St Elijah the Thunderer in Christian folklore. But he was also sometimes equated with St Michael, and sometimes even with the Christian god, while in some Russian or Belarusian folk stories, he was downgraded to various fairy characters such as Tsar Ogin (Tsar Flame) or Grom (Thunder). Notwithstanding changes in the name itself, there are always some key words present that were used to describe Perun as a symbol in ancient mythical texts, and have survived through folklore. Perun is always gore (up, above, high, on the top of the mountain or in heaven; Perun is a heavenly god, and he is also the 'highest' deity of old Slavic pantheon), he is suh (dry, as opposite of wet; he is god of thunder and lightning, which causes fire), he treska/razbija/goni/ubija (strikes/sunders/pursues/kills; he is a god of thunder and storms, destructive and furious) with strela/kamen/molnija (arrow/stone/lightning; Perun's weapons, are of course, his bolts of lightning. He fires them as arrows so powerful they explode and blow up stones when they hit them). These key words are always preserved in folklore traces, even if the true name of Perun has been long since forgotten. Consequently, the structure of this symbol allowed the identification of Perun with similar characters either from Christian religion or from later folklore, which share these similarities in the structure of their own symbols. Following similar methodology, and drawing parallels with the structure of other, related Indo-European mythologies (particularly Baltic mythology), and occasionally using some hints found in historical records of Slavic paganism, some of the ancient myths could be reconstructed. Significant progress in the study of Slavic mythology was made during the last 30 years, mostly through the work of the Russian philologists Vladimir Toporov and Vyacheslav Ivanov, as well as that of the Croatian scientists Radoslav Katičić and Vitomir Belaj. Also very valuable are the studies of Russian scholar Boris Uspensky and of Serbian philologist and ethnologist Veselin Čajkanović. However, uncritical interpretation of folklore or unskilled reconstruction of myths can lead to disastrous effects, as explained below. When dealing with Slavic mythology, one cannot be too careful or too critical about the validity and authenticity of sources. Scholarly interest in beliefs of ancient Slavs has been continually waxing since the times of Renaissance, and with it the overall number of confusions, errors, misinterpretations, and unsupported reconstructions (not to mention inventions) has also increased. No valid scientific methodology by which folklore accounts could be interpreted was known before the mid-20th century, and with sparse historical and archeological sources, the doors were thus opened to wild and unwarranted speculation. One of the best examples of overall confusion and complete misinterpretation is a fake deity of love, Lada or Lado, constructed from meaningless exclamations in Slavic wedding songs. Gods such as Koleda and Kupala were constructed from misinterpreted names of popular Slavic folk festivals; Koledo was the Slavic name for Christmas processions of carol singers, while the source of the name Kupala is from kupati meaning "to bathe". Christian sources claim that it comes from Ivan Kupala (literally: John the Baptist) however this claim is as baseless as the claim of those who choose to interpret it as a pagan holiday. This festival day is celebrated at the summer solstice in many Slavic, and also western European countries, such as France and Italy. These customs indeed do have more than a few elements of pre-Christian beliefs, but simply inventing gods based on names of customs is not considered a valid method for reconstruction of lost beliefs. 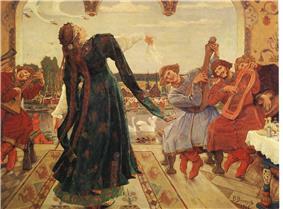 In his early works, notably The Firebird and The Rite of Spring, Igor Stravinsky sought to evoke the imagery and rhythms of pagan Slavic ritual. 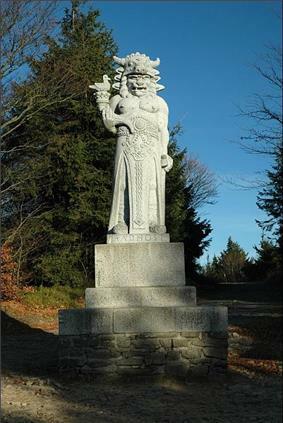 Misinterpretation of Thiethmar's historic description of Wendish paganism led to confusion between a god, Svarožič, and the city in which his temple stood, Radegast. Since the name Radegast can be easily etymologised as meaning "Dear guest", this led to the construction of Radegast as the supposed Slavic god of hospitality and sun. Likewise, to pair up with a deity with the sinister sounding name of Chernobog (Black god) mentioned by Helmod, the White God, or Belobog, was invented. That name is not found in any reliable historic or ethnographic record; rather, it was simply assumed that, since there already was a Black God, there simply had to be a White God as well. Again, this is clearly not a scientific approach to the study of Slavic mythology, but pages and pages have been written about the supposed Belobog-Chernobog dualism so far, and many books and scholarly references even today take for granted that such gods were truly worshipped by ancient Slavs. Even more questionable than confusions or misinterpretations are deliberate forgeries. 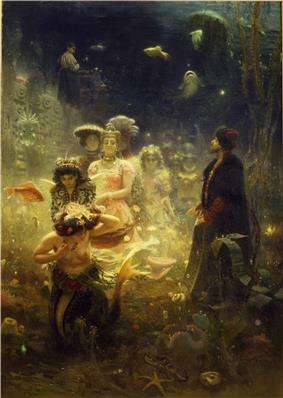 In the nineteenth and twentieth century, the general population became increasingly interested in Slavic mythology, fuelled by various Germanic runes, or folk songs and stories were "recorded" in which half of the Slavic pantheon is described as picking flowers or merrily dancing around a bonfire. The 19th century Book of Veles, which claims to be an authentic written record of old Slavic religion from the 9th or 10th century CE, written in Cyrillic, whereas it cannot be proven that the Slavs had any sort of writing system before Christianisation, let alone that they used the Cyrillic alphabet (named, of course, after St Cyril, who coined the first known writing system for Slavs when he was sent together with his brother Methodius to baptise them in the 9th century on the request of Prince Rastislav the ruler of Great Moravia ). Some of the Slavic neopagans use the Book of Veles as their sacred text, and consequently, insist that the document is authentic. However, the original book, supposedly written on birch barks, was lost (if indeed it ever existed), and thus its authenticity cannot be established at present. Slavic myths were cyclical, repeating every year over a series of festivities that followed changes of nature and seasons. Thus, to understand their mythology, it is important to understand their concept of calendar. On the basis of archeological and folklore remains, it is possible to reconstruct some elements of the pre-Christian calendar, particularly major festivals. The year was apparently lunar and began in early March, similar to other Indo-European cultures whose old calendar systems are better known to us. The names for the last night of the old year and the first day of the new year are reconstructed as Velja Noc (*Velja Notj)/Velik Dan (Velikŭ dĭnĭ) (Great Night/Great Day). After Christianization, these names were probably passed onto Easter. In Slavic countries belonging to Orthodox Churches, Easter is known as Velik Dan/Great Day, while among Catholic Slavs, it is known as Velika Noc/Great Night. The names blend nicely with the translation of the Greek Megale Evthomada, Great Week, the Christian term for the week in which Easter falls. In pagan times, however, this was a holiday probably quite like Halloween. Certain people (shamans) donned grotesque masks and coats of sheep wool, roaming around the villages, as during the Great Night, it was believed, spirits of dead ancestors travelled across the land, entering villages and houses to celebrate the new year with their living relatives. Consequently, the deity of the last day of the year was probably Veles, god of the Underworld. The spring fertility festival of Maslenitsa, rooted in pagan times and involving the burning of a straw effigy is still celebrated by Slavs all over the world, as seen here in Melbourne, Australia. There was a large spring festival dedicated to Jarilo, god of vegetation and fertility. Processions of young men or girls used to go round villages on this day, carrying green branches or flowers as symbols of new life. They would travel from home to home, reciting certain songs and bless each household with traditional fertility rites. The leader of the procession, usually riding on a horse, would be identified with Jarilo. The custom of creating pysanki or decorated eggs, also symbols of new life, was another tradition associated with this feast, which was later passed on to Christian Easter. The summer solstice festival is known today variously as Pust, John the Baptist (Ivan Kupala Day). Overall, the whole festivity probably celebrated a divine wedding of a fertility god, associated with the growth of plants for harvesting. It is unclear when exactly the end of harvest was celebrated, but historic records mention an interesting tradition associated with it that was celebrated at the Svantevit temple on the island of Ruyana (present-day Rugen), and survived through later folklore. People would gather in front of the temple, where priests would place a huge wheat cake, almost the size of a human. The high priest would stand behind the cake and ask the masses if they saw him. Whatever their answer was, the priest would then plead that the next year, people could not see him behind the ritual cake, i.e. that the next year's harvest would be even more bountiful. There was probably also an important festival around winter solstice, which later became associated with Christmas. Consequently, in many Slavic countries, Christmas is called Bozhich, which simply means little god. While this name fits very nicely with the Christian idea of Christmas, the name is likely of pagan origin; it indicated the birth of a young and new god of the sun to the old and weakened solar deity during the longest night of the year. The old sun god was identified as Svarog, and his son, the young and new sun, as Dažbog. An alternative (or perhaps the original) name for this festival was Korochun or Koleda. The Serbian tradition of "Badnja Vece" on Christmas Eve can also provide hints into pre-Christian Slavic rituals. In this ceremony, oak branches are collected, and each is adorned with ribbons. A priest will "bless" the branches with water, wheat (or barley) and perhaps walnuts. Interestingly, the infant Jesus is not mentioned in the service. At the conclusion of the ceremony, an oak log is set ablaze. A fairly typical cosmological concept among speakers of Indo-European languages, that of the World Tree, is also present in Slavic mythology. It is either an oak tree, or some sort of pine tree. The mythological symbol of the World Tree was a very strong one, and survived throughout the Slavic folklore for many centuries after Christianisation. Three levels of the universe were located on the tree. Its crown represented the sky, the realm of heavenly deities and celestial bodies, while the trunk was the realm of mortals. They were sometimes combined together in opposition to the roots of the tree, which represented the underworld, the realm of the dead. The pattern of three realms situated vertically on the gods and mortals was situated in the center of the earth, encircled by a sea, across which lay the land of the dead, to where birds would fly every winter and return from in spring. In many folkloric accounts, the concepts of going across the sea (idit) versus coming from across the sea (dolazit) are equated with dying versus returning to life. This echoes an ancient mythological concept that the afterlife is reached by crossing over a body of water. Additionally, on the horizontal axis, the world was also split; in this case by four cardinal points, representing the four wind directions (north, east, south, west). These two divisions of the world, into three realms on the vertical axis and into four points on the horizontal, were quite important in mythology; they can be interpreted in statues of Slavic gods, particularly those of the three-headed Triglav and the four-headed Svantevit. As noted in the description of historical sources, a very wide range of deities were worshipped by Slavs, on a huge geographical area from the shores of the Baltic to the shores of the White Sea, in a time span of over 600 years. Historic sources also show that each Slavic tribe worshipped its own gods, and thus probably had its own pantheon. Overall, ancient Slavic religion seems to be fairly local and cultic in nature, with gods and beliefs varying from tribe to tribe. However, just as in the case of the various Slavic languages — it can be shown that they originate from a single, Proto-Slavic language — it is also possible to establish some sort of Proto-Slavic Olympus and, through careful study of folklore, reconstruct some elements of this original pantheon, from which the various gods of the various Slavic tribes originated. There are various modern theories about the supreme Slavic deity being Rod or Svarog, and historic sources show that deities such as Svarožič, Svantevit or Triglav were worshipped as supreme by certain tribes. But overall, the best candidate for the position of supreme deity is by far Perun. His name is the most common in all historic records of Slavic religion; in fact, he is the first Slavic god mentioned in written history (Procopius in his short note mentions that the god of thunder and lightning is the only god of Slavs, lord of all). The Primary Chronicle identifies him as chief god of Kievan Rus before Christianisation. A short note in Helmold's Chronica Slavorum states that West Slavs believe in a single deity in heaven who rules over all the other deities on earth; the name of this deity is not mentioned, but nevertheless it seems quite possible this was a reference to Perun. And even though we do not find the name of Perun in any of the extensive records of West Slavic religion, he was known by all branches of Slavs, as shown by a vast number of toponyms that still bear his name in all Slavic countries today. Finally, by analysing the folklore texts, one will notice that Perun is the only Slavic deity who was equated with the Christian god. These are very strong indications that Perun was indeed the supreme god of the original Proto-Slavic pantheon. Perun, however, had a match. As Roman Jakobson pointed out, whenever Perun is mentioned in historic texts, he is always "accompanied" by another god, Veles. This relationship can be observed in toponyms as well. Wherever we find a hill or a mountain peak whose name can be associated with Perun, below it, in the lowlands, usually near a river, there will be a place with a name reminiscent of Veles. Consequently, as Perun was sometimes identified with the Сhristian God in folklore accounts, Veles was identified with the Devil. Gromoviti znaci or thunder marks such as these were often engraved upon roof beams of houses to protect them from lightning bolts. Identical symbols were discovered on Proto-Slavic pottery of 4th century Chernyakhov culture. They are thought to be symbols of the Slavic god of thunder Perun. Ivanov and Toporov reconstructed the ancient myth involving the two major gods of the Proto-Slavic pantheon, Perun and Veles. The two of them stand in opposition in almost every way. Perun is a heavenly god of thunder and lightning, fiery and dry, who rules the living world from his citadel high above, located on the top of the highest branch of the World Tree. Veles is a chthonic god associated with waters, earthly and wet, lord of the underworld, who rules the realm of the dead from down in the roots of the World Tree. Perun is a giver of rain to farmers, god of war and weapons, invoked by fighters. Veles is a god of cattle, protector of shepherds, associated with magic and commerce. Many places in various Slavic countries still carry the god's name: Perun (the famous mountain in Bosnia Herzegovina, Vareš), Perunac, Perunovac, Perunika, Perunička Glava, Peruni Vrh, Perunja Ves, Peruna Dubrava, Perunuša, Perušice, Perudina and Perutovac. These names today mostly represent mountain tops, but in medieval times, large oaks, sacred groves and even entire villages or citadels were named Perun. Also, as mentioned already, in Ukrainian 'perun' and in Polish 'piorun' means "thunderbolt". Among South Slavs, a mountain plant Iris germanica is known in folklore as perunika ("Perun's plant") and sometimes also as bogisha, ("god's plant"), and was believed to grow from ground that had been struck by lightning. A cosmic battle fought between the two of them echoes the ancient Indo-European myth of a fight between a storm god and a dragon. Attacking with his lightning bolts from the sky, Perun pursues his serpentine enemy Veles, who slithers down over the earth. Veles taunts Perun and flees, transforming himself into various animals, hiding behind trees, houses, or people. In the end, Perun catches up with the dog Veles turned into and eventually befriends him using kind words and bits of meat, only to then grab the dog and throw him into a lake, where Veles drowns. Perun does not actually destroy Veles, but simply returns him to his place in the world of the dead. Thus the order of the world, disrupted by Veles's mischief, is established once again by Perun. The idea that storms and thunder are actually a divine battle between the supreme god and his arch-enemy was extremely important to Slavs, and continued to thrive long after Perun and Veles were replaced by the Сhristian God and Devil. A lightning bolt striking down a tree or burning down a peasant's house was always explained through the belief of a raging heavenly deity bashing down on his earthly, underworldly, enemy. The enmity of the two gods was explained by Veles' theft of Perun's cattle, or by Perun's theft of Veles' cattle (since Veles was the god of cattle, the matter of ownership here is not clear). Cattle follows its owner around. So stealing human cattle, as many super powers of the free world would point out is counter-productive to any country, hence the countries are at war at the moment.The motif of stealing divine cattle is also a common one in Indo-European mythology; the cattle in fact may be understood simply as a metaphor for heavenly water or rain. But we can try with complete certainty to overlook the direct implications of human beings being compared to cattle in religious books of some very active groups. Thus, Veles steals rain water from Perun, or Perun steals water for rain from Veles (again, since Veles is associated with waters, and Perun with sky and clouds, it is unclear to whom rain should belong). An additional reason for this enmity may be wife-theft. From folklore accounts it seems that the Sun was sometimes considered to be Perun's wife (an odd idea, as all Slavic sun-gods, like Hors and Dažbog, are male). However, since the Sun, in the mythic view of the world, dies every evening, as it descends beyond the horizon and into the underworld where it spends the night, this was understood by Slavs as Veles' theft of Perun's wife (but again, the rebirth of the Sun in the morning could also be understood as Perun's theft of Veles' wife). 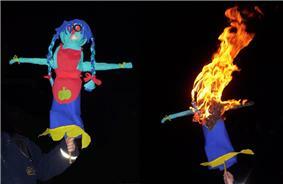 The burning of Marzanna at spring equinox is one of the remains of pre-Christian beliefs in today's Polish culture. Katicic and Belaj continued down the path laid by Ivanov and Toporov and reconstructed the myth revolving around the fertility and vegetation god. Jarilo is god of the vegetation and spring, and his sister and wife, Morena (Marzanna), goddess of winter and death. Jarilo is associated with the Moon and Morena is considered a daughter of the Sun. Both of them are children of Perun, born on the night of the new year (Great Night). However, on the same night, Jarilo is snatched from the cradle and taken to the underworld, where Veles raises him as his own. At the Spring festival of Jare/Jurjevo, Jarilo returns from the world of the dead (from across the sea), bringing spring from the ever-green underworld into the realm of the living. He meets his sister Morana and courts her. At the beginning of summer, the festival later known as Ivanje/Ivan Kupala celebrated their divine wedding. The sacred union between brother and sister, children of the supreme god, brings fertility and abundance to earth, ensuring a bountiful harvest. Also, since Jarilo is the (step)son of Veles, and his wife the daughter of Perun, their marriage brings peace between two great gods; in other words, it ensures there will be no storms that could damage the harvest. After the harvest, however, Jarilo is unfaitfhul to his wife, and she vengefully slays him (returns him into the underworld), renewing the enmity between Perun and Veles. Without her husband, god of fertility and vegetation, Morana — and all of nature with her — withers and freezes in the upcoming winter; she turns into a terrible, old, and dangerous goddess of darkness and frost, and eventually dies by the end of the year. The whole myth would repeat itself anew each following year, and retelling of its key parts was accompanied by the major yearly festivals of the Slavic calendar. The story also shows numerous parallels to similar myths of Baltic and Hittite mythology. The name of Svarog is found in a few East Slavic manuscripts, where it is usually equated with the Greek smith god Hephaestus from historic sources, indicates he was also a god of fire and blacksmithing. According to the interpretation by Ivanov and Toporov, Svarog had two sons: Svarožič, who represented fire on earth, and Dažbog, who represented fire in the sky and was associated with the Sun. Svarog was believed to have forged the Sun and have given it to his son Dažbog to carry it across the sky. In Russian manuscripts he is equated with the Sun, and folklore remembers him as a benevolent deity of light and sky. Serbian folklore, however, presents a far darker picture of him; he is remembered as Dabog, a frightful and lame deity guarding the doors of the underworld, associated with mining and precious metals. Veselin Čajkanović pointed out that these two aspects fit quite nicely into the symbolism of the Slavic solar deity; a benevolent side represents Dažbog during the day, when he carries the Sun across the sky. The malevolent and ugly Dabog carries the Sun through the underworld at night. This pattern can also be applied to the Sun's yearly cycle; a benevolent aspect is associated with the young summer Sun, and a malevolent one with the old winter Sun. Svarožič was worshipped as a fire spirit by Russian peasants well after Christianisation. He was also known among Western Slavs, but there he was worshipped as a supreme deity in the holy city of Radegast. Svarožič is simply a diminutive of Svarog's name, and thus it may simply be another aspect (a surname, so to speak) of Dažbog. There is also the point of view that Svarog was the ancestor of all other Slavic gods, and thus Svarožič could simply be an epithet of any other deity, so that Dažbog, Perun, Veles, and so on, were possibly all Svarožičs. It is somewhat ironic that the position of these two in the Proto-Slavic pantheon is unclear, yet the historic accounts written about them are the most extensive. That they were important to all pagan Slavs is indicated by a significant number of toponyms whose names can be associated with them and by discoveries of multi-headed statues in various Slavic lands. Both of these gods were considered supreme in various locations; they were associated with divination and symbolized by the horse. A possibly significant difference is that Svantevit had a white horse while Triglav had a black one, and Svantevit was represented with four heads while Triglav (whose name simply means three-headed) with three. Svantevit was also associated with victory in war, harvest, and commerce. Various hypotheses about them were proposed: that they are in fact one and the same deity, being somewhat similar; that they are not gods at all but compounds of three or four gods, a kind of mini-pantheons. Slavic neopagans tend to think of Triglav in particular as a concept of Trinity. Svantevit has also been proclaimed as a late West Slavic alternation of Perun or Jarilo, or compared with Svarožič and deemed a solar deity. None of these hypotheses is quite satisfactory, and mostly they are just wild speculation, another attempt to reconstruct Slavic mythology as it should be, rather than discovering what it really was like. Further research is necessary before more can be said of these deities. It is claimed that Slovenia's highest mountain, Triglav, is named after the god Triglav. These names mean simply Dawn and Daystar, but in folklore accounts of all Slavic nations, they are often described as persons, or associated with persons, in pretty much the same way as Sun and Moon. Danica is often called Sun's younger sister or daughter, and was probably associated with Morana. Consequently, Zorica was either Sun's mother or older sister. It is quite possible this was a Slavic relic of the Proto-Indo-European dawn god. The first subsequent development occurred after the Proto-Slavs had split into East, West, and South Slavs. Each branch of the Slavic family devised various feminine deities of household (e.g. Mokosh), and deities associated with crafts, agriculture, and fertility (e.g. Rod and Chur). Deities such as Hors and Simargl are sometimes interpreted as the East Slavic borrowings from their Iranian neighbours. At the level of abstract personification of divine functions, we have such concepts as Pravda/Krivda (Right/Wrong), Dobra Kob/Zla Kob (Good Fortune/Evil Fortune). 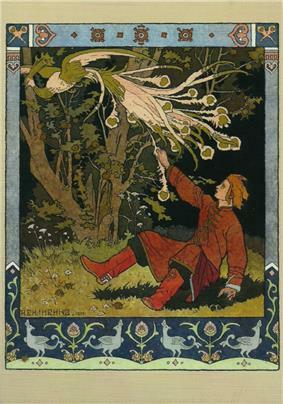 These concepts, found in many Slavic fairy tales, are presumed to have originated at a time when old myths were already being downgraded to the level of legends and stories. Loius Leger pointed out that various Slavic words describing success, destiny, or fortune are all connected with the ancient Slavic word for God — "bog". Although used to denote the god of Christianity, the word is of pagan origin and quite ancient. It originates from the Proto-Indo-European root *bhag (meaning fortune), being cognate to Avestic baga and Sanskrit bhagah (epithets of deities). The next level of development is a mythologisation of historical traditions. Beginning in pagan times, it continued well after the advent of Сhristianity. It is characterised by tales and songs of legendary heroes, ranging from purely legendary founders of certain tribes, such as the stories about Lech, Czech, and Rus, to quite historical persons such as the 15th century Croatian-Hungarian king Matthias Corvinus or the Serbian Prince Marko, who were both immortalised in folk legend or poetry. Russian bylinas about bogatyrs, Polish legends of Krak the Dragonslayer, Czech legends about Libuše, and the foundation of Prague all fall into this category. Various elements of these tales will still reveal elements of old myths (such as a hero slaying a dragon, a faint echo of an ancient concept of a cosmic battle between Perun the Thunderer and the serpentine Veles). On an even lower level, certain mythical archetypes evolved into fairy-tale characters. These include Baba Yaga, Koschei the Immortal, Nightingale the Robber, Vodyanoy, Zmey Gorynych, and so on. At this point of development, one can hardly speak of mythology anymore. Rather, these are legends and stories with some fragments of old myths, but their structure and meaning are not so clear. 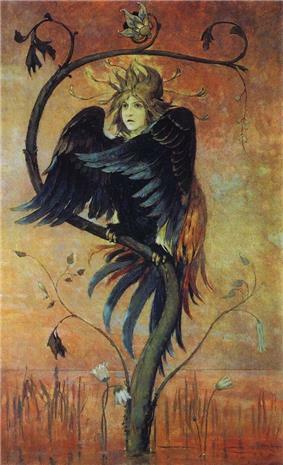 The lowest level of development of Slavic mythology includes various groups of home or nature spirits and magical creatures, which vary greatly among different Slavic nations. Mythic structure on this level is practically incomprehensible, but some of the beliefs nevertheless have a great antiquity. As early as the 5th century, Procopius mentioned that Slavs worshipped river and nature spirits, and traces of such beliefs can still be recognised in the tales about vilas, vampires, witches, and werewolves. 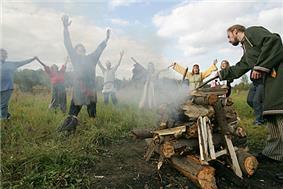 A Slavic pagan ritual in modern Russia. For the last few decades, Slavic paganism has gained limited popularity among the Russian public, with many web sites and organizations dedicated to the study of Slavic mythology and some who openly call for "returning to the roots". Some musicians are also influenced by paganism, such as pagan metal band Arkona. Most of the neopagan movements take place in Russia and Belarus, but they also take place in other Slavic countries like Bosnia and Herzegovina, Montenegro, Serbia, FYROM, Bulgaria, Slovenia, Slovakia, Poland, Croatia, Czech Republic and Ukraine. ^ French, Marilyn (2002). From Eve to Dawn: A History of Women in the World. McArthur. ^ "Влх.Богумил. Кровавые жертвоприношения у Славян: Разоблачение мифа. - Велeсов круг". Velesovkrug.ru. Retrieved 2015-10-22. ^ "Книга "Кровавые жертвоприношения у славян. Разоблачение мифа" Влх. Богумил - купить книгу ISBN 978-5-91742-055-4 с доставкой по почте в интернет-магазине". Ozon.ru. Retrieved 2015-10-22. ^ "Кровавые жертвоприношения у славян. Разоблачение мифа |". Garland.org.ua. Retrieved 2015-10-22. ^ "Информационный портал Языческой традиции" [Information Portal Pagan Tradition] (in Russian). Triglav.ru. Retrieved 2015-10-23. ^ "Язычество Славян" [Pagan Slavs] (in Russian). Paganism.msk.ru. Retrieved 2015-10-23. ^ "Slavic spiritualism website calling for returning to the roots" (in Russian). Slavn.org. Retrieved 2015-10-23. Chrypinski, Anna, editor. Polish Customs. Friends of Polish Art: Detroit, MI, 1977. Contoski, Josepha K., editor. Treasured Polish Songs with English Translations. Polanie Publishing Co.: Minneapolis, MN, 1953. Estes, Clarissa Pinkola, Ph.D. Women Who Run With the Wolves. Ballantine Books: New York, 1992. Gimbutas, Marija. The Slavs. Preager Publishers: New York, 1971. Ingemann, B. S. Grundtræk til En Nord-Slavisk og Vendisk Gudelære. Copenhagen 1824. Knab, Sophie Hodorowicz. Polish Customs, Traditions, & Folklore. Hippocrene Books: New York, 1993. Knab, Sophie Hodorowicz. Polish Herbs, Flowers, and Folk Medicine. Hippocrene Books: New York, 1995. Boris Rybakov. Ancient Slavic Paganism. Moscow, 1981. Franjo Ledić. Mitologija Slavena — knjiga I, Zagreb, 1970. god. V. Belaj. Hod kroz godinu, mitska pozadina hrvatskih narodnih vjerovanja i obicaja, Golden Marketing, Zagreb 1998. Excerpt from Boris Rybakov's book "Early Centuries of Russian History"
Wolf von Schierbrand (1920). "Slavic Mythology".